Net sarees had reached its zenith a few years back but its eclipse was evident when the popularity got diluted for some reasons unknown. The eclipse is over and so is the year and we are readily looking forward to what the New Year has to unfurl. 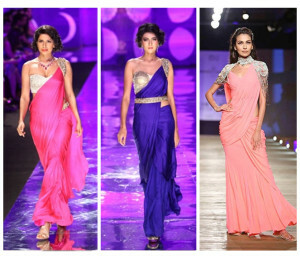 Fortunately the net sarees have found its way back in the big screens, runways and red carpets. Madhuri Dixit looked fabulous in the reality show Jhalak-Dikhla-Jaa Season 6 on Colors when she left the audience and the viewers spell bound under her red net saree. Lately we have been observing how all her turn out events is in the beautiful netted drape and we are wondering why had the net saree been eclipsed? The gorgeous net saree is the perfect saree to hold on to Indian tradition in the most modern way. India has every type of saree imaginable and among all, the Net sarees are one of the most splendid varieties which bring out the woman’s elegance, making her look extremely sensational and stylish. Women adore these sarees because of its flimsy, soft and see-through texture which accentuates their features by adding a touch of sensuality to the appearance. They are available in different assortments in terms of its texture such as super net, stiff net, soft net, shimmer net and so on in attractive colors. * The flimsy transparent fabric that is light weight, flowy, sensual and graceful accentuates your features to perfection as the draping of the fabric is perfect. * The universality of the netted drapery is such that you can find it in every color possible with any designs and style because the industry is flooded with competition. Saree shops in the market are displayed with exquisite netted sarees draped on the mannequin. Do some pre planning before setting your shoes out for shopping the netted drapes. *Netted sarees are not likely to be worn casually because the eye-catching regalia call for more attention than going to a grocery store. It is meant to be worn on occasions and function where looking your best tops your priority list. *The best thing about the netted saree is that it can be accessorized real quick. Your matching clutch and stilettos will make you look runway without much effort. It is perfect for the modern woman who is really busy but intends on looking her best. *The delicate fabric befits any special occasion. Be it your friend’s birthday party or your sister’s wedding or even a romantic dinner date the saree embodies a look that will make you look resplendent without over doing anything. *If in case you yourself are the bride then net saree is an option for you too. A bride in net will look sensual, beautiful, elegant and perfect on her big day! *Wearing a matching blouse and a petticoat is somewhat a challenge but if you surpass that fashion emergency then there will literally be no one to steal the show from you. Satin petticoat is a safer and preferred choice to go with the net saree. We say what we see and by the look of it the phoenix of the net saree has risen to the highest strata of new fashion. The classic red and black, the serene white, the gorgeous golden, the pretty pastels net sarees have made the hottest come-back for the collection this year. Net sarees with its ethnic charm with a touch of latest vogue has taken the Indian fashion to a whole new dimension. Saying it again, net sarees are beautiful but it is rather tricky to maintain it for it can wear and tear easily. Make sure to keep it folded in the wardrobe and avoid wearing sharp edged accessories with it. Beauty comes with caution so do the needful and shine the brightest among the rest with the most beautiful net sarees.